I made this wreath for under $10 in under 1 hour. That is my kind of project. I used a straw wreath and kept the plastic on it. They are cheaper then the foam wreaths. I cut strips of fabric and then wrapped it around the wreath. I just hot glued it to the wreath at the end of the piece of fabric. Then I hot glued felt flowers on that I found at Hobby Lobby. I found them near the hair accessories. This project would be even cheaper if you made your own flowers. When I shop at HL, I only buy things that are 1/2 off or I use a coupon. Super easy and Super cute. So cute in fact... I needed TWO of them! I just painted my kitchen doors black. And these wreathes are the perfect accessory for them. I also just moved my pink mantle into the kitchen. This thing has decorated just about every room in my house. So far this is my favorite place for it! This is the door, before the wreath, and before being painted. Oh and another inexpensive project that I did, was make curtains for them out of drop cloths. That was definitely under $10 and took less then an hour! I can't wait to check out all the other people's projects so I can get inspired! 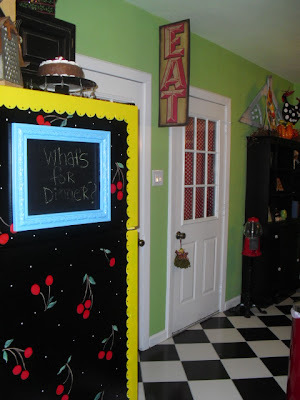 I love the doors painted black and those wreaths are just adorable! Love them!! I also like the mantle in the kitchen - so cute there, it really fits. Your house is seriously the coolest ever! And the wreaths..love!!! !